How the Oracle of Omaha came to know his sweet spot. And why he never strays from it. The world of business is complicated. For an investor like Warren Buffett, his job to make it easier to comprehend. If a business is complex or subject to constant change, we're not smart enough to predict future cash flows. Incidentally, that shortcoming doesn't bother us. What counts for most people in investing is not how much they know, but rather how realistically they define what they don't know. An investor needs to do very few things right as long as he or she avoids big mistakes. During his research, Buffett separates what he understands from the things he calls "too hard." The Oracle of Omaha, by his own admission, is not keen on working outside of his comfort zone. And it's this self-imposed restraint that's been central to Berkshire's market-crushing returns. Buffett's office in Omaha. The bin on his desk is labelled "Too Hard." Source: YouTube, CBSNewsOnline. The tech industry serves as a prime example of a field that lies beyond Buffett's grasp. He's notoriously avoided cutting-edge technology like the plague, whether it's in his personal life or his investing activities. The born-and-bred Midwesterner lacks a computer in his Omaha office, struggles with the basic functions on his cell phone, and prefers a tried-and-true fax machine to email. By most definitions of the word, Buffett's a bit of a Luddite. He knows it, though, and it suits him just fine. By the same token, Buffett steers clear of investing in high growth technology companies. For him and his partner Charlie Munger, buying shares in a company like Apple just wouldn't fit in their wheelhouse. And it's not that they don't appreciate the profound impact that Apple's products have on today's society. Technology is clearly a boost to business productivity and a driver of better consumer products and the like, so as an individual I have a high appreciation for the power of technology. I have avoided technology sectors as an investor because in general I don't have a solid grasp of what differentiates many technology companies. I don't know how to spot durable competitive advantage in technology. To get rich, you find businesses with durable competitive advantage and you don't overpay for them. Technology is based on change; and change is really the enemy of the investor. Change is more rapid and unpredictable in technology relative to the broader economy. To me, all technology sectors look like 7-foot hurdles. As of each year-ending in September. Apple's method of categorization changed slightly in some years, so iPhone sales reflect most recently reported figures. Source: Apple's SEC 10-K filings. Back in 2007, the iPhone and iPad were basically off the radar for the tech giant, at least from a financial perspective. The iPhone had barely made its debut, and the iPad was still being conceived in the mind of Steve Jobs. Neither product would have merited much attention in a typical cash flow model at the time. But fast-forward six years and the two combined gadgets accounted for 72% of Apple's revenue, which had grown at an astounding 40% annual clip. For Buffett, or virtually anyone for that matter, the astronomical growth that lied ahead for Apple was highly unpredictable, if not inconceivable. And that's why Buffett, by is own admission, is just "not smart enough" to play ball in that arena. 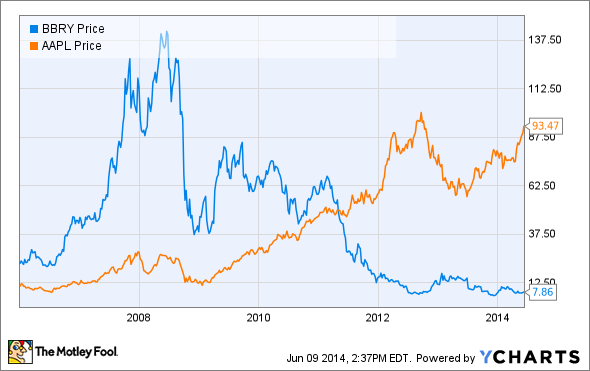 Now, you might be thinking that Apple's ability to blaze a new trail in smart devices proves that Buffett was wrong. From 2007 to today, he missed the boat on a mind-boggling return of 673% for patient Apple investors. The latter looked like geniuses while Buffett got left in the dust! What the Apple versus Blackberry showdown reveals is that Buffett has witnessed both sides of the coin flip over the years. As a result, he's opted out of the here-today-gone-tomorrow world of technology entirely. He's not saying, however, that you should do the same. What Buffett expounds in his letters and teachings is to stay inside what he calls a "circle of competence." Consumer technology falls outside of his particular circle, but that doesn't mean others can't master it. He suggests that all investors should stick to industries they know inside and out. If your decades of retail experience, for example, gives you insight into Costco or Target's competitive advantage, then that might be your bread-and-butter sector. If you're a computer programmer, on the other hand, you could have a leg up on identifying the next tech idol like Google. Regardless of your chosen realm of expertise, however, Buffett and Munger emphasize the importance of recognizing the outer limits. Identifying that boundary at Berkshire Hathaway proved to be a challenging and oftentimes humbling experience. But in the end, as Munger describes in the quote below, avoiding the temptation to stray from one's comfort zone can separate the pros from the amateurs in investing: "We know the edge of our competency better than most. That's a very worthwhile thing. It's not a competency if you don't know the edge of it."